This red roan mare was born in January of 2005. Her dam is FOUR 976, as good a mare as one could hope to own. We bought the dam as a weanling from Haythorn Land and Cattle Co. located near Arthur, Nebraska. Cee Booger Roan's sire is GB Cee Booger Red CL. He is now in Mexico. This mare is aka Raspberry. She has produced three outstanding foals for us. In 2013 she had a blue roan filly out of Mighty Mystic Call. 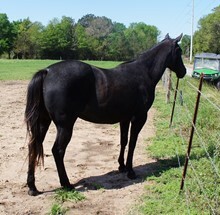 This long yearling blue roan filly is growing nicely and really shows her running quarter horse blood.